Carport, Pergolas and Patio for all Roofs. Are you looking to create an outdoor entertaining area or to provide protection for your car or boat? Rainbow Building Solutions also offers a range of options for carports, pergolas and patios. If you want a combination of attractive, well engineered and affordable designs then we are able to help you out. We can fully manage your project from designing, council approvals right through to preparing the concrete slab and installation. Or if you prefer to install your carport or pergola yourself, we will provide the necessary instructions and after-sale support. 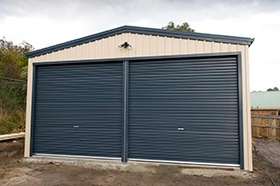 All of our carports and pergolas are made from Australian BlueScope® steel, and the connections are fully bolted for greater strength and durability. They come with a 15 year warranty which gives you peace of mind. We have some handy resources to the right hand side of this page where you can request our brochures, pricelist and colour options. You can also browse our Carport Gallery for some examples. If any of the available designs don’t suit your needs then talk to us about how we can provide a custom solution for you. Please send us an enquiry or give us a call on 1300 737 910. Rainbow Building Solutions is an authorised distributor for the Lysaght Living® range of products, a steel based home improvement range manufactured by BlueScope® Lysaght and backed by Australia’s leading steel manufacturer, BlueScope® Steel. Enjoy outdoor living all year round while adding style and value to your home. You can choose from patios, verandas and carports manufactured from Australian made Colorbond® steel, and available in a number of design options and a wide range of modern colours with a sleek gloss finish. Styles available include Skillion, Pitched Dutch, Pitched Hip and Pitched Gable designs. A Designer option provides the ability to create a custom home improvement roof style with a gable insert to ensure your outdoor area is complete. The range includes styles to suit any home and budget, with flexible, engineered free-standing or attached designs that can be tailored to meet roofing, gutter and colour requirements. The Lysaght Living® comes with a 15 year warranty, for your peace of mind, and is fully engineered to Australian standards. It won’t warp, chip or peel, and is rot and termite resistant. A low maintenance solution to complement almost every architectural style and design! See the range of Lysaght Living® products in the Gallery.